New York City requires commissioning (Cx) for most* ground-up new construction projects through the 2014 and 2016 energy codes** to build better buildings and protect owners/developers. But if you’re like many NYC developers we know, you may have mixed feelings about commissioning and are not sure what the real benefit is to you. In the past, someone may have tried to explain commissioning to you in complex engineering terms that just left you frustrated, confused, or uninterested. We recognize that there is a lot of confusion about what exactly commissioning is, and there are many services that fall under the banner of “commissioning,” not all of which provide value beyond checking boxes. This blog will break down the commissioning process and how it can deliver maximum value to you and your projects. Through quality commissioning, you will see tangible benefits such as cost savings in construction and operations of the building, longer life of the equipment and systems, as well as increased comfort and happiness of the future residents (and staff!). Commissioning is an essential quality assurance process that helps ensure all systems are designed optimally, installed correctly, and operate accordingly at the time of occupancy. Your Commissioning Agent manages all aspects of the process. If done correctly, commissioning will save owners and developers the money and hassle by identifying and fixing problems long before a building is ever occupied. Far from being an annoying box to check in order to comply with code, commissioning is a crucial element of each project. The purpose of commissioning is to make sure that the building you ultimately get meets the expectations you had for it at the start. For maximum benefit, commissioning should be performed in three phases that extend throughout the planning and construction process: Design Phase, Construction Phase, and Pre-Occupancy Phase. What type of population will it serve? What temperatures do you want to supply to residents? What services or amenities will be on site? How will you staff the building once it is operational? Are the step-by-step sequence of operations of each piece of equipment appropriate? Are piping and duct layouts optimal? Will this equipment be serviced appropriately and accessed easily down the line? How can systems be designed to increase energy efficiency and savings? Gets the project’s big picture yet, at the same time, is detail oriented. Anticipates challenges before they arise, often during the design phase. Reviews any suggested changes to the design to make sure they don’t cause unforeseen problems before the construction phase. Becomes a familiar face at the construction site, coordinating with the construction team to deliver quality and that all milestones are hit in a timely fashion. Is a clear, powerful communicator, providing clients with regular updates, and logs. If a quote for commissioning is significantly cheaper than others, be wary. Do they have the necessary experience? Will they be in design meetings and on site often enough to have a positive impact on both the design and its execution? As with most anything else in life, you get what you pay for. Mistakes in the short term can lead to expensive complications later when tenants have already moved in. The design phase is critical to the commissioning process. There are a lot of complexities in designing and constructing a building, and it’s important to realize that just because the design makes sense on paper does not mean it will translate that way in construction. For example, a good Cx Agent will suggest locations of isolation valves, sensors, and potential access points to enable the ability for continuous commissioning and the isolation of system components. The Cx agent will also verify that the access panels, piping, and ductwork are designed in a way that will allow for easy maintenance access. Having a Cx Agent ensure the design meets the intentions of the building through a collaborative process allows everyone to create the best design possible, from all areas of expertise. It can also save you a lot of money in the construction phase. Unfortunately, there is only so much a Cx Agent can do if they are brought on during construction. Each time Bright Power was brought on to a project after the design phase, we found significant components of design that were either overcomplicated (and therefore more expensive than necessary to install and maintain), detrimental to optimal equipment function, or were installed in a way that prevents basic access (ex: no access hatches). Had we been involved from the project’s inception, those problems would have been identified and eliminated before the construction phase, resulting in significant savings and fewer headaches. You might be tempted to blame such issues on the MEP or the architect. But, having worked with dozens of great design teams with top-notch professionals, I can attest that this level of collaboration necessary to avoid these sorts of problems. During construction, the Cx Agent will work with your General Contractor and HVAC subcontractors to ensure equipment installation is correct and the start-up and operation of the equipment is optimized to the design. This requires a great deal of coordination and trust between all parties involved. The Cx Agent is there to help provide a good outcome on behalf of the whole team – not to step on anyone’s toes. To do that, they must be on site during all key points in the construction process. Just imagine the frustration of having to open up a wall to fix a mistake when it could have been caught and corrected by the Cx Agent if they were on site. That’s not only frustrating for you, the owner, but it’s also frustrating for the team who just had to rip out completed work only to do it all again, the right way. Once the equipment is operational, the Cx Agent will perform a series of functional performance tests designed to diagnose problems that could pop up during occupancy. If any issues are found, the Cx Agent will list them in a log and work with the relevant parties to correct the issues. 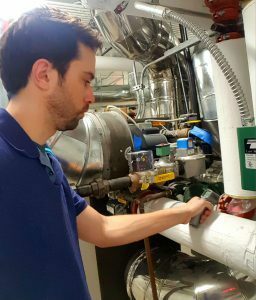 The kinds of things that we have found and corrected through functional performance tests include fans installed backward; sensors in the wrong place that produce inaccurate readings; ductwork that was not properly attached, resulting in rooms with extremely cold and hot temperatures. If the Cx Agent has done her/his job, all of the building’s equipment will have been installed correctly. While this doesn’t sound exciting, think of it this way: you just spent millions of dollars on a project that took years of careful planning, coordination, and execution. If the final step – occupancy – would be held up for a few months due to equipment issues, that delay would be both costly and maddening. But that’s nothing compared to the hair-pulling frustration that would result from learning that commissioning typically represents less than 0.25% of a new construction project’s total cost, whereas fixing a commissioning mistake can cost you millions of dollars (and you might need to put up your new residents in a hotel while you sort out the issue). The final phase of commissioning is to train your building site-staff so that diagnostic, operational, and maintenance procedures are second nature. As your Cx Agent, we work with your contractors to produce a training curriculum for your building operators. (S)he will then film the training for future use. There’s a reason why energy code requires commissioning in the first place — to build better buildings. Rather than being a trivial added upfront cost, commissioning is a critical process to protect your investment. Take it from our clients: It’s one of the best investments you can make on your new construction project. Still have commissioning questions? Our experts are here to answer any of your energy and water-related questions. Contact us today! *Exceptions include mechanical and service hot water systems in buildings where the total mechanical equipment capacity being installed is less than 480,000 Btu/h (140.7 kW) cooling capacity and 600,000 Btu/h (175.8 kW) combined service water-heating and space-heating capacity. **The commissioning requirements in the NYC energy code are primarily for testing and report generation during the Construction Phase. However, in order to maximize the economic and building performance benefits of commissioning, industry best practices recommend a comprehensive commissioning process that covers all phases.